The Kalman filter is useful for tracking different types of moving objects. It was originally invented by Rudolf Kalman at NASA to track the trajectory of spacecraft. At its heart, the Kalman filter is a method of combining noisy (and possibly missing) measurements and predictions of the state of an object to achieve an estimate of its true current state. Kalman filters can be applied to many different types of linear dynamical systems and the “state” here can refer to any measurable quantity, such as an object’s location, velocity, temperature, voltage, or a combination of these. In a previous article, I showed how face detection can be performed in MATLAB using OpenCV. In this article, I will combine this face detector with a Kalman filter to build a simple face tracker that can track a face in a video. If you are unfamiliar with Kalman filters, I suggest you read up first on how alpha beta filters work. They are a simplified version of the Kalman filter that are much easier to understand, but still apply many of the core ideas of the Kalman filter. The OpenCV-based face detector can be applied to every frame to detect the location of the face. Because it may detect multiple faces, we need a method to find the relationship between a detected face in one frame to another face in the next frame — this is a combinatorial problem known as data association. The simplest method is the nearest neighbour approach, and some other methods can be found in this survey paper on object tracking. However, to greatly simplify the problem, the tracker I have implemented is a single face tracker and it assumes there is always a face in the frame. This means that every face that is detected can be assumed to be the same person’s face. If more than one face is detected, only the first face is used. If no faces are detected, a detection error is assumed. The MATLAB code below will detect the face location in a sequence of images and output the bounding box coordinates to a CSV file. In the video below, I have run this script on the FGnet Talking Face database (which is free to download) and displayed the bounding boxes overlayed on the image sequence. You can download a copy of the faces.csv file that was used to generate the video from here. The bounding box roughly follows the face, but its trajectory is quite noisy and the video contains numerous frames where the bounding box disappears because the face was not detected. The Kalman filter can be used to smooth this trajectory and estimate the location of the bounding box when the face detector fails. The Kalman filter is a recursive two-stage filter. At each iteration, it performs a predict step and an update step. The predict step predicts the current location of the moving object based on previous observations. For instance, if an object is moving with constant acceleration, we can predict its current location, , based on its previous location, , using the equations of motion. The update step takes the measurement of the object’s current location (if available), , and combines this with the predicted current location, , to obtain an a posteriori estimated current location of the object, . 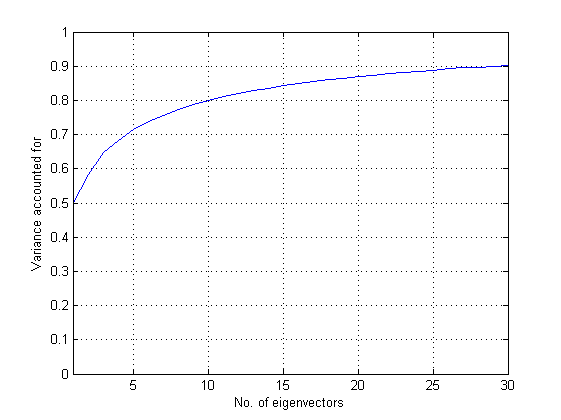 is the current state vector, as estimated by the Kalman filter, at time . is the measurement vector taken at time . measures the estimated accuracy of at time . defines the mapping from the state vector, , to the measurement vector, . and define the Gaussian process and measurement noise, respectively, and characterise the variance of the system. and are control-input parameters are only used in systems that have an input; these can be ignored in the case of an object tracker. Note that in a simple system, the current state and the measurement will contain the same set of state variables (only will be a filtered version of ) and will be an identity matrix, but many real-world systems will include latent variables that are not directly measured. For example, if we are tracking the location of a car, we may be able to directly measure its location from a GPS device and its velocity from the speedometer, but not its acceleration. In the update stage, we first calculate the difference between our predicted and measured states. We then calculate the Kalman gain matrix, , which is used to weight between our predicted and measured states and is adjusted based on a ratio of prediction error to measurement noise . Both the stages only update two variables: , the state variable, and , the prediction error covariance variable. In order to implement a Kalman filter, we have to define several variables that model the system. We have to choose the variables contained by and , and also choose suitable values for , , and , as well as an initial value for . where and are the upper-left and lower-right corners of the bounding box around the detected face, respectively. This is simply the output from the Viola and Jones face detector. where and are the first-order derivatives. Other vectors are also possible; for example, some papers introduce a “scale” variable, which assumes that the bounding box maintains a fixed aspect ratio. Decreasing the values in means we are optimistically assuming our measurements are more accurate, so the filter performs less smoothing and the predicted signal will follow the observed signal more closely. Conversely, increasing means we have less confidence in the accuracy of the measurements, so more smoothing is performed. where . The filter will then prefer the information from the first few measurements over the information already in the model. The following script implements the system we have defined above. It loads the face detection results from CSV file, performs the Kalman filtering, and displays the detected bounding boxes. Clearly we can see that this video has a much smoother and more accurate bounding box around the face than the unfiltered version shown previously, and the video no longer has frames with missing detections. In the future, I aim to write an article on the extended Kalman filter (EKF) and unscented Kalman filter (UKF) (and the similar particle filter). These are both non-linear versions of the Kalman filter. Although face trackers are usually implemented using the linear Kalman filter, the non-linear versions have some other interesting applications in image and signal processing. In Malcolm Gladwell’s bestseller The Tipping Point, he outlines a theory called “The Law of the Few” that identifies key types of people in social networks. One of the important ones is the connector. Connectors are hubs in the network. The idea is that, rather than society consisting of one large sparsely connected network, it consists of many smaller, densely connected networks, and these smaller networks are in turn connected together by the connectors forming a network of networks known as a “small-world network”. Most people know at least one connector, and it is through these key people and their fellow connectors that we are connected to the rest of the world. An interesting experiment is to explore your own personal social network to identify the connectors. An easy way to get an idea of your network is from your email mailbox. If we assume that the sender and all of the recipients of each group email we send or receive know each other, we can scan our mailbox and build a graph with email addresses as the nodes and edges joining the email addresses of people who know each other. In a previous post, I showed how Gmail messages can be easily accessed from many programming languages using an SQLite driver. Using this, we can find our social network from our Gmail mailbox. First we need to connect to the Gmail SQLite database with the standard sqlite3 library in Python. You need to set up Gmail Offline and locate your Gmail data file, as described in my previous post. I also suggest that you increase the Gmail Offline recent message range and re-sync your messages so that you have a larger collection of messages to work with (instructions can be found here – I set mine to 3 months). To represent and analyse the network, I have used the excellent Python NetworkX library from the Los Alamos National Lab, which you will have to install, as well as matplotlib to render the network figures. The get_email_graph function above has a second parameter, ignored_addresses, which can be used for excluding particular email addresses from the graph. 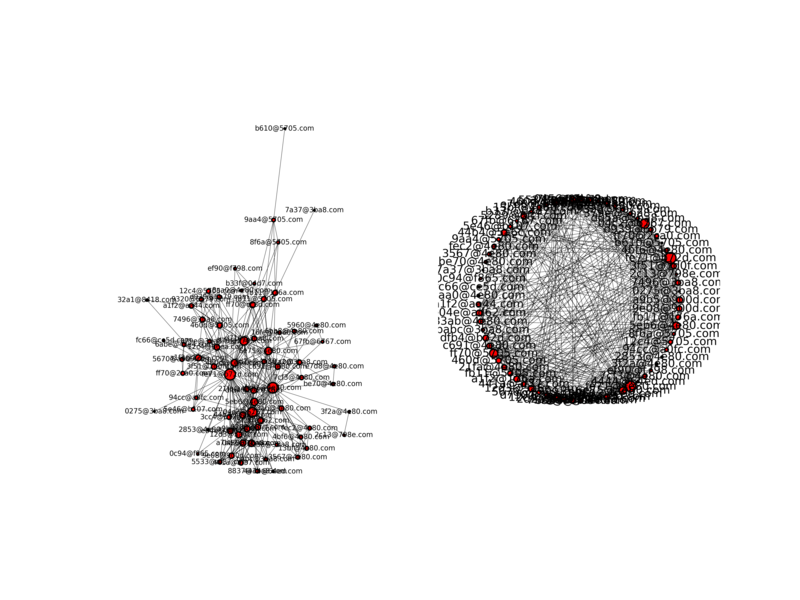 Because the social network is built from your own mailbox, you will be at the centre of the graph and connected to every other node, and will always appear to be a large connector. For this reason, I removed myself from the network to see how everyone else in the network is connected to one another. If you have multiple email addresses but don’t have Gmail configured with all of your forwarded email addresses, you can manually specify all of your email addresses as a list and then pass it to the get_email_graph function as above. Clearly we can see that, rather than a single network, it is composed of multiple separate connected components. In my case, it was immediately apparent that these components correspond to different groups of people that I regularly deal with – one is my friends and family, another my work colleagues, and the remaining two are classmates and staff at two different universities I am associated with. Above I have labelled what each component corresponds to. 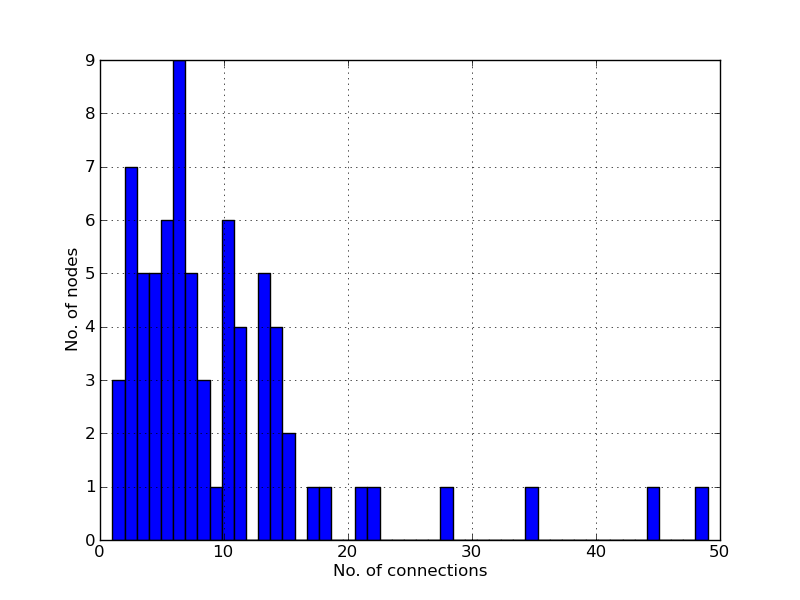 Below are examples of two component plots generated for my social network. The first is my & family network and the second is my work network. The NetworkX library has a wealth of graph algorithms that can be used to calculate interesting statistics on the graphs, such as the shortest path between two nodes and various centrality measures. 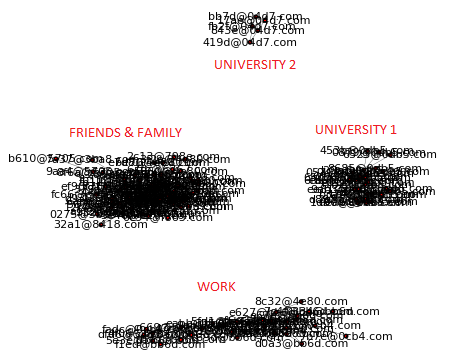 In the figure below, the friends and family network has been enlarged and the email address labels removed. We can see that the network contains a handful of large nodes with large numbers of connections, with the majority having only a few connections. These large nodes are clearly the connectors amongst my friends and family network that Gladwell discussed. The majority of the nodes have a degree of less than 20. The “six degrees of separation” theory claims that every person in the world is connected to every other person by a chain of no more than approximately six connections. In graph theory terms, this means that the maximum shortest path between any two nodes in the graph is no more than 6. My friends & family graph has a maximum shortest path length of 5 and an average of 2.1 (calculated with the shortest_path_length function), which seems to agree with this theory. Social networking websites such as Friendster and LinkedIn have leveraged the idea of “six degrees of separation” by allowing you to build your social network by connecting to your friends’ connections. Calculating the degrees of separation has been solved by multiple well-studied algorithms. However, these algorithms often do not scale well – for instance, the Floyd-Warshall algorithm has O(n3) time and O(n2) space complexity. Implementing an algorithm to find the n-level network of each person to every other person in a parallel and dynamic manner and on an extremely large network consisting of many thousands or millions of nodes, as must be the case for many social networking websites, is certainly an interesting and challenging problem – one which I plan to write a future article on. 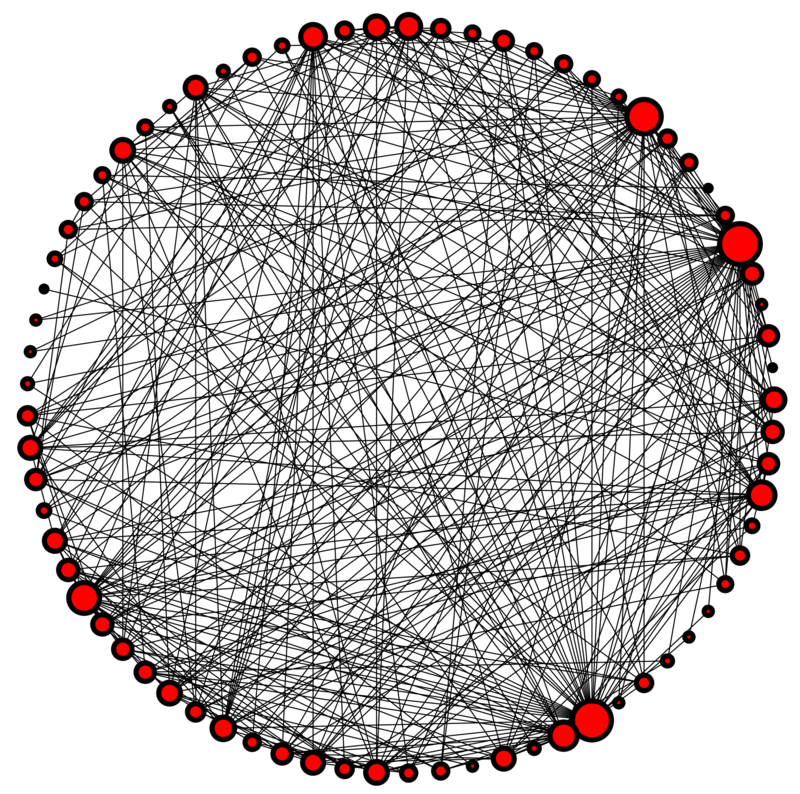 The approach I have used represents the social network as an unweighted and undirected graph. One extension to the approach above could be to use a weighted graph, where the weights are the total number of emails between each pair of people. This would have the advantage of giving a higher weighting to connections between people who frequently communicate and would prevent a single large group email from giving all of its recipients a high degree. 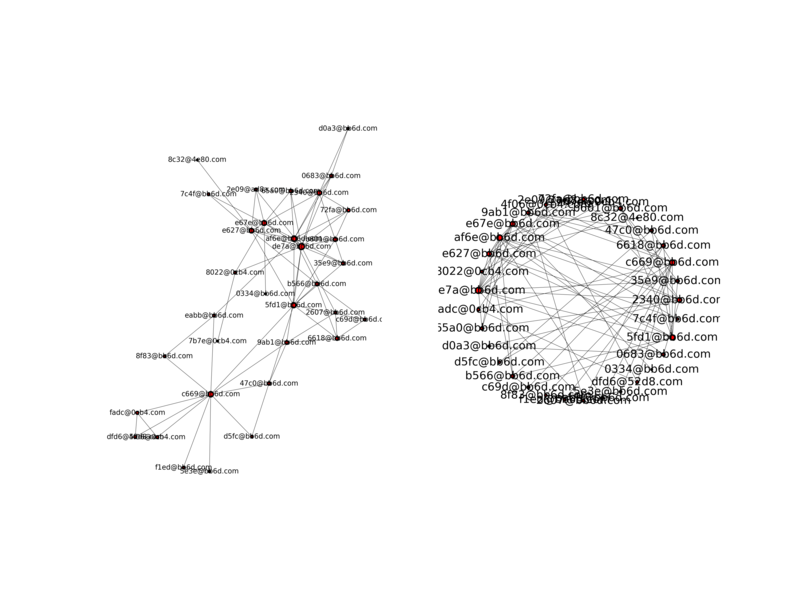 Another extension could be to use a directed graph, where each node points to the node it received the email from. This would result in the edges tending to point to frequent communicators, and an algorithm such as PageRank (which is implemented in NetworkX) could be used to analyse the most “important” nodes. Wake-on-LAN is a nifty feature of some network cards that allows you to remotely power on a workstation sitting on the local network. This is an OS-agnostic feature that works by broadcasting a specially crafted “magic” packet at the data link layer. The target computer sits in a low-power state with only its network card switched on, and when it receives the magic packet, the network card “wakes up” the computer, powering it on and booting it up. Google is your friend here; I won’t delve into the specifics of enabling Wake-on-LAN, and will assume you have successfully set it up in the following discussion. As explained above, when a computer with Wake-on-LAN enabled is switched off, its network card waits in a low-power mode listening for a special “magic” packet that signals the computer to power on. In order to wake up a computer, you need to know its MAC address (the computer is not switched on, so it doesn’t have an IP address yet). There are various ways of checking the MAC address of a computer. In Windows, the simplest way is to type “ipconfig /all” in a command prompt and look for the “physical address” listed for your network adapter. In Linux, the equivalent is “ifconfig“. If you correctly enabled Wake-on-LAN on your target host, it should power on shortly after receiving this packet. An important thing to note is that Wake-on-LAN operates below the IP level. This means that the sending machine needs to be on the LAN, so we cannot send them over remote IP-based connections, such as over SSH or VPN. Also, while this article only dealt with Wake-on-LAN over a wired local network, it is possible to perform wake-up over wi-fi (try Googling for “WoWLAN” if you are trying to wake up computers over wi-fi). You may have also noticed that Wake-on-LAN is very insecure. Any host can wake up any other computer on the LAN with Wake-on-LAN enabled armed with only its MAC address. Some NICs do allow password-protected WOL but, as far as I know, this is not widely implemented. In image processing, one of the most successful object detectors devised is the Viola and Jones detector, proposed in their seminal CVPR paper in 2001. A popular implementation used by image processing researchers and implementers is provided by the OpenCV library. In this post, I’ll show you how run the OpenCV object detector in MATLAB for Windows. You should have some familiarity with OpenCV and with the Viola and Jones detector to work through this tutorial. The above output shows that MATLAB has successfully loaded the cascade file and returned a pointer to an OpenCV CvHaarClassifierCascade object. However, in step 5.1 of our object detector steps, we require a CvRect object. Normally in C++ you would simply cast the character pointer return value to a CvRect object, but MATLAB does not support casting of return values from calllib(), so there is no way we can cast this to a CvRect. The solution is what is referred to as a prototype M-file. By constructing a prototype M-file, we can define our own signatures for the imported functions rather than using the declarations from the C++ header file. This changes the return type for cvGetSeqElem() from a char pointer to a CvRect pointer. We now have all the pieces ready to write a complete object detector. The code listing below implements the object detector steps listed above to perform face detection on an image. Additionally, the image is displayed in MATLAB and a box is drawn around any detected faces. Note: If you get a segmentation fault attempting to run the code above, try evaluating the cells one-by-one (e.g. by pressing Ctrl-Enter) – it seems to fix the problem.